Leading Wholesale Trader of autoglow signages, mandatory safety signs, prohibition safety signs, fire safety signs, first aid safety signs and night glow safety signs from Mumbai. We have over two decades of vast industrial knowledge and experience in producing superior quality Auto Glow signs. 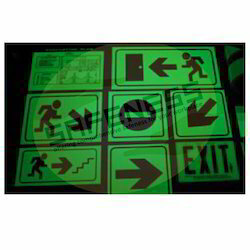 These Photoluminescent Safety Signages are used to prevent untoward accidents during total darkness / no scope for electrified signs at the building, industries, malls or any public place. These signs glow brightly in the dark making it clearly visible to humans. They charge itself automatically in daylight and at night they use the energy stored inside to glow in the dark for a couple of hours. They can glow at a stretch of 2,4,6,8 or 10 hours. Our range of size and material ensure the availability of right option suitable for your place/workplace at all times. Colours: Black or Multi-Colour. It makes use of fluorescent colours. The basic materials used in manufacturing Luminescent Signs are well tested by our testing team to ensure its safety. Our engineers and technical team also provide customised designs Photoluminescent Signs as per customer requirements and applications. With more than two decades of experience in the field of Industrial Safety Products, we have emerged as a respectable leader for the supply of Warning Sign. By keeping the track of latest market trends, we are engaged in offering an extensive range of Mandatory Safety Signs to our clients. 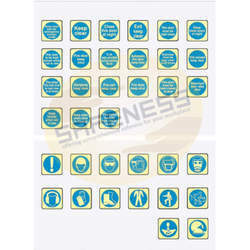 The offered safety signs are precisely designed from supreme quality basic material and the latest technology. 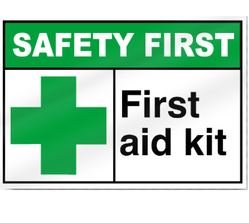 Moreover, these safety signs are available in variegated sizes and specifications for our clients to choose from. Our provided safety signs are checked against different quality measures so as to ensure their quality. Our product Danger Sign was developed keeping in mind the safety of people working in manufacturing plants and indoor or outdoor work sites. This Hazard Warning Sign conforms to government standards and industry regulations. With an objective to fulfil the demands of our respectable clients, we are engaged in manufacturing, exporting, retailing and supplying a wide range of Prohibition Safety Signs that are used to prevent any area from unauthorized people accessing there. Our provided safety signs are manufactured by using quality tested basic material and innovative technology by our skilled professionals. In order to maintain their quality, these safety signs are sternly checked on different parameters. Our Restriction Sign is being exported to global regions like of Middle East, Africa, South Asia, Latin America, Europe, Bangladesh, Bhutan, Nepal, Sri Lanka and many more. This Area Security Sign provides adequate protection to a person working in adverse working conditions. Our Safety Sign follows industrial norms depending on the product. We have over two decades of vast industrial knowledge and experience in producing superior quality Fire Extinguisher Sign. These signs are used to caution / warn people on potential dangers from fires at building, industries, malls or any public place. It takes care of human safety. They are majorly used to warn on timely escape during fire / emergencies to safeguard people and property. They are majorly used to show fire exits or fire extinguishers. They are also used to inform safety actions / measure to be taken in case of fire. Our range of size and material ensure the availability of right option suitable for your place / workplace at all times. 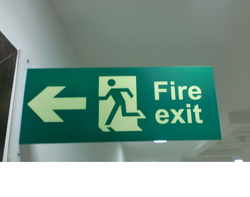 Our engineers and technical team also provide customised designs Fire Exit Sign as per customer requirements and applications. We are among the prestigious names in the industry, engaged in offering First Aid Sign to our valuable customers. These signs are used to educate/inform people on first aid measures during accidents/fires at the building, industries, malls or any public place. It takes care of human safety. They are majorly informatory signs. Our range of size and material ensure the availability of right option suitable for your place/workplace at all times. The offered First Aid Poster is designed with vast domain expertise of our professionals and is highly appreciated for their optimal functionality. This Emergency Medical Sign is known for its optimal design, easy installation, easy-to-use . We are long-time established manufacturer, distributor, importer and exporter of Arrow Sign. Our Emergency Exit Sign are being exported to global regions like of Middle East, Africa, South Asia, Latin America, Europe, Bangladesh, Bhutan, Nepal, Sri Lanka and many more. We are long-time established manufacturer, distributor, importer and exporter of Arrow Sign. These signs are used to prevent untoward accidents during total darkness / no scope for electrified signs at building, industries, malls or any public place. These signs glow brightly in the dark making it clearly visible for humans. It takes care of human safety. 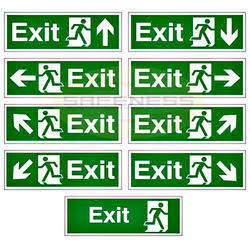 They are majorly used to guide people when they want to find exits or safety informatory signs. Our range of size and material ensure the availability of right option suitable for your place / workplace at all times. Workplace Safety Sign provides adequate protection to a person working in adverse working conditions. Our Night Glow Safety Sign follows industrial norms depending on the product. Auto Glow Safety Sign are used in various industries like Metallurgy, Chemical, Cement, Oil and Gas, Construction and so on. We have over two decades of vast industrial knowledge and experience in producing superior quality Emergency Safety Sign. These signs are used to guide people at the time of crisis at workplace or any public property to handle emergencies. It safeguards people as well as property. They are mainly used to show effective steps to be taken in case of emergency situations. Our range of size and material ensure the availability of right option suitable for your place / workplace at all times. Our engineers and technical team also provide customised designs Industrial Safety Sign as per customer requirements and applications. 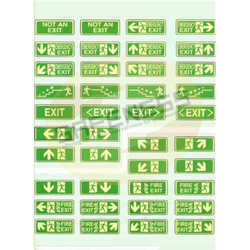 We are long-time established manufacturer, distributor, importer and exporter of Safety Signs. 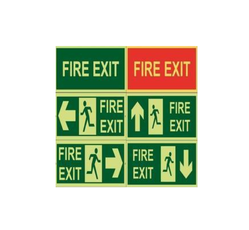 These signs are used to guide people at the time of crisis on timely exits and entries at the workplace or any public property to handle emergencies. It safeguards people as well as property. 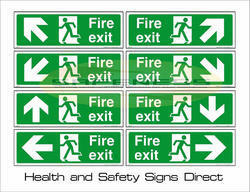 They are mainly used to show emergency exits or entries or fire safety signs. Our range of size and material ensure the availability of right option suitable for your place/workplace at all times. Our Entrance Doors Signs & Labels are being exported to global regions like of Middle East, Africa, South Asia, Latin America, Europe, Bangladesh, Bhutan, Nepal, Sri Lanka and many more. These signs are used to caution / warn people on potential dangers at construction sites/areas. They are mainly used to indicate regarding dangers ahead or above. Our range of size and material ensure the availability of right option suitable for your place/workplace at all times. Construction Safety Sign Board is available in customised styles and colours as per customer’s demand. Our quality management team, inspects and tests Work Site Safety Sign before it is dispatched to customers. 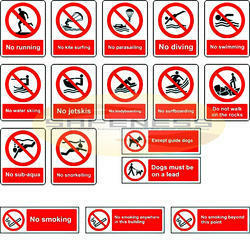 We are the prominent manufacturer, supplier, trader, distributor and exporter of Industrial Safety Sign. These signs are used to indicate potential dangers at industrial areas and guide people on dos and donts. Our range of size and material ensure the availability of right option suitable for your place / workplace at all times. Weather Proof, UV Resistant, Water Resistant, Termite Proof, Heat resistant etc. This Industrial Hazard Sign allows the workers to handle hazardous tasks in the workplace with adequate safety. Safety Signage finds its application in industries like Power, Energy, Railways, Automobiles, Aviation, Engineering and Construction. Our product is well known for its convenience to use, high strength, lightweight and high durability. 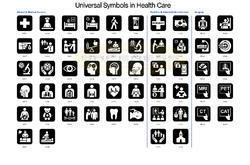 We offer extensive and comprehensive range of Hospital Sign. These signs are used to inform people on the facilities available at the hospital or healthcare premises. They are mainly used to give guidance to patients and attendants. Our range of size and material ensure the availability of right option suitable for your place / workplace at all times. Healthcare Safety Sign is used in work areas which are prone to higher risk of accidents. The product Hospital Premises Signs is designed keeping in mind all innovative approaches to safety and demands, made by industries worldwide. In addition, we offer varied range of Informatory Sign which are being widely used in industries like Metallurgical, Steel, Aluminium, Power, Energy, Petrochemical, Oil & Gas, Glass, Chemical, Cement Offshore & Onshore Industry, Furnace Areas, Fire Departments, etc. With more than two decades of experience in the field of Industrial Safety Products, we have emerged as a respectable leader for the supply of Parking Sign. These signs are used to give parking instructions to drivers in parking areas at hospitals, malls, buildings, hotels, public parking places etc. Our range of size and material ensure the availability of right option suitable for your place/workplace at all times. 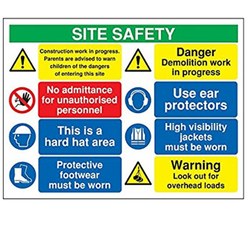 Our product Safety Sign was developed keeping in mind the safety of people working in manufacturing plants and indoor or outdoor work sites. This Parking Instruction Sign conforms to government standards and industry regulations. New models of this Auto Glow Parking Sign keep developing to produce higher quality products without cutting corner. We are known for creating a wide range of innovative and sustainable products for the industrial markets among which Regulatory Sign stands on its design, strength and reliability. These signs are used to ensure people at hospitals, malls, buildings, hotels, public parking places etc. adhere to regulatory rules and regulations. They mainly indicate the dots of any particular area. Our range of size and material ensure the availability of right option suitable for your place/workplace at all times. Street Regulatory Sign is recommended for labours, workers and inspection officers to use while performing their duties at the site. These Highway Safety Sign are finely finished and are known for their ability to provide optimal protection. We are long-time established manufacturer, distributor, importer and exporter of Personal Protection Sign. These signs are used to alert / warn people on potential dangers from flammable material at various laboratories, factories etc. It prevents humans from entering risky areas. It also informs regarding flammable materials in the area. Our range of size and material ensure the availability of right option suitable for your place / workplace at all times. Our Warning Sign are being exported to global regions like of Middle East, Africa, South Asia, Latin America, Europe, Bangladesh, Bhutan, Nepal, Sri Lanka and many more. Personal Safety Glow Sign provides adequate protection to a person working in adverse working conditions. We offer extensive and comprehensive range of Alert Sign. These are general safety signs used to alert people on potential dangers at any workplace or public areas. They are common safety signs that can be used in all kinds of areas. Our range of size and material ensure the availability of right option suitable for your place / workplace at all times. Warning Sign is used in work areas which are prone to higher risk of accidents. Colours: Black or Multi-Colour. It makes use of Flourescent colours. The product Exit Sign is designed keeping in mind all innovative approaches to workforce safety and demands, made by industries worldwide. In addition, we offer varied range of Industrial Safety Sign which are being widely used in industries like Metallurgical, Steel, Aluminium, Power, Energy, Petrochemical, Oil & Gas, Glass, Chemical, Cement Offshore & Onshore Industry, Furnace Areas, Fire Departments, etc. 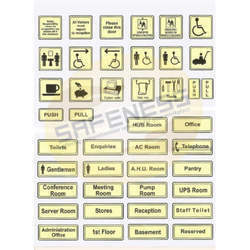 We are among the prestigious names in the industry, engaged in offering Hotel Safety Sign to our valuable customers. These safety signs are used at different hotels, motels and Lodges. 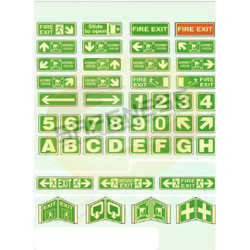 They consist of all kinds of safety signs like informatory, warning, facility, emergency, nightglow, prohibitory etc. This being used at hospitality industry, they are very important to guide and warn guests at the hotel for their safety. Our range of size and material ensure the availability of right option suitable for your place / workplace at all times. The offered Hotel Signs is designed with vast domain expertise of our professionals and are highly appreciated for their optimal functionality. These Night Glow Informatory Sign is known for its optimal design, easy installation, easy-to-use. 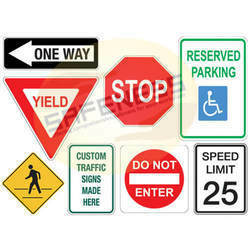 We are the prominent manufacturer, supplier, trader, distributor and exporter of Caution Sign. 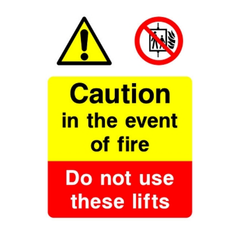 These safety signs are used to warn / caution or inform people about safety measures at office / workplace. 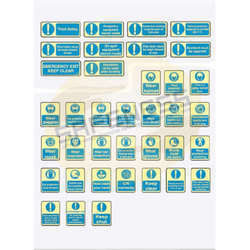 They consist of all kinds of safety signs like informatory, warning, facility, emergency, nightglow, prohibitory etc. Our range of size and material ensure the availability of right option suitable for your place / workplace at all times. This Informatory Sign allows the workers to handle hazardous tasks at workplace with adequate safety. Our product Workplace Safety Sign is well known for its convenience to use, high strength, lightweight and high durability. These safety signs are used to inform people about important notices. They basically indicate the dos and donts in an area. Our range of size and material ensure the availability of right option suitable for your place / workplace at all times. Now Companies have started adopting increased safety measures since it has become mandatory to follow safety protocols. Audits for Notice Sign take place to check their conformance to safety and quality standards set by government and testing bodies. To keep up with growing demand of Wall Mounted Notice Sign, we keep adequate stocks at any given time. This Industrial Notice Display Sign is compact and light weight so that it occupies less space and becomes easy to transport. With more than two decades of experience in the field of Industrial Safety Products, we have emerged as a respectable leader for the supply of Warning Sign . As a quality-oriented organization, we are focused to provide our clients excellent quality Danger Safety Signs that are used to alert the people from the danger area. The offered safety signs are manufactured by our proficient professionals using the best quality basic material and innovative technology in adherence with industry standards. 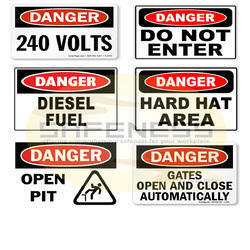 Furthermore, these safety signs can be easily customized in different dimensions and designs as per clients' needs. This Hazard Warning Sign conforms to government standards and industry regulations. New models of this Prohibition Sign keep developing to produce higher quality products without cutting corner. 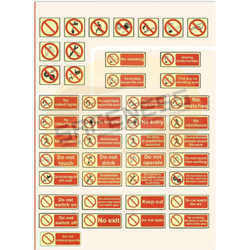 We are long-time established manufacturer, distributor, importer and exporter of No Smoking Sign.This Prohibition Sign being light weight but sturdy offers comfort along with protection. 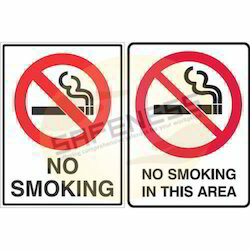 These signs are used to restrict people from smoking in critical areas like petrol pump, airport, hotels etc. They are mainly used to restrict smoking in areas containing flammable items. Our range of size and material ensure the availability of right option suitable for your place / workplace at all times. 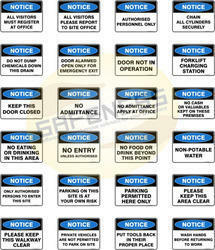 Warning Sign is available in customised styles and colours as per customer’s demand. We are known for creating a wide range of innovative and sustainable products for the industrial markets among which No Entry Sign stands on its design, strength and reliability. 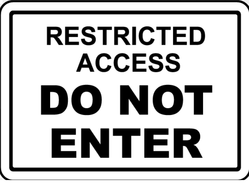 These signs are used to restrict people from restricted or dangerous areas. They are also used to indicated restricted items in important areas. Our range of size and material ensure the availability of right option suitable for your place/workplace at all times. No Exit Sign is recommended for labours, workers and inspection officers to use while performing their duties at the site. These Hazard Warning SSignsare finely finished and are known for their ability to provide optimal protection. Now Companies have started adopting increased safety measures since it has become mandatory to follow safety protocols. Audits for Warning Sign take place to check their conformance to safety and quality standards set by government and testing bodies. 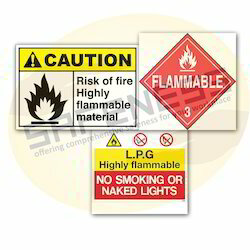 These signs are used to caution / warn people of industrial, fire, chemical hazards at the workplace or any public place. It takes care of human health safety. It safeguards people as well as property. They are majorly informatory warning signs. Our range of size and material ensure the availability of right option suitable for your place/workplace at all times. To keep up with growing demand for Industrial Safety Sign, we keep adequate stocks at any given time. This Hazard Warning Sign is compact and lightweight so that it occupies less space and becomes easy to transport. We are one of the prominent names in the industry, offering Property Safety Sign. These signs are used to safeguard important properties, buildings, offices or any public property. It safeguards people as well as property. They are mainly used to inform about restricted areas, security signs, general caution or safety at school property. Our range of size and material ensure the availability of right option suitable for your place / workplace at all times. We offer broad selection of Security Sign for construction, chemical, food service, metal, cement , marine and other industries.We study the market demand for Area Security Sign regularly and keep optimum stock levels. 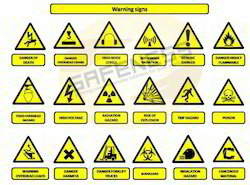 We have over two decades of vast industrial knowledge and experience in producing superior quality Hazard Warning Sign. These signs are used to alert / warn people on potential dangers from flammable material at various laboratories, factories etc. It prevents humans from entering risky areas. It also informs regarding flammable materials in the area. Our range of size and material ensure the availability of right option suitable for your place/workplace at all times. Our engineers and technical team also provide customised designs Hazardous Material Alert Sign as per customer requirements and applications. Our Traffic Safety Sign helps in protecting workers from life-threatening hazards at the workplace. These signs are installed on the roads to prevent road accidents and takes care of human safety. These signs should be located at most appropriate locations on the road for better visibility of the signs and advance intimation of cautions or warning. They are majorly used to information regarding the type of road, speed limit, road work, points of interest etc. Our range of size and material ensure the availability of right option suitable for your place/workplace at all times. Road Work Sign is available in customised styles and colours as per customer’s demand. Our quality management team, inspects and tests Speed Limit Sign before it is dispatched to customers. 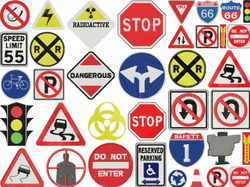 With more than two decades of experience in the field of Industrial Safety Products, we have emerged as a respectable leader for the supply of Traffic Safety Sign. This Road Warning Sign conforms to government standards and industry regulations. New models of this keep developing to produce higher quality products without cutting corner. These signs are used to prevent untoward accidents on ships, offshores, onshores, coasts etc. They are mainly used for marine safety. It is used during total darkness / no scope for electrified signs at the building, industries, malls or any public place. These signs glow brightly in the dark making it clearly visible to humans. They charge itself automatically in daylight and at night they use the energy stored inside to glow in the dark for a couple of hours. They can glow at a stretch of 2,4,6,8 or 10 hours. Our range of size and material ensure the availability of right option suitable for your place/workplace at all times. Looking for Autoglow Safety Signs ?